← Amy Khor : I Visited Coffeeshops During This Election Season So I Know What People Want, OK? Government To Deploy Underpaid Nsmen As UshersTo Solve Private Transport Companies’ Problems. When times are good, our lowly paid Nsmen have to pay for trips in buses and trains. When times are bad, apparently the same Nsmen will have to serve as ushers. Why should our NSMen be burdened with the extra responsibility of supporting the operations of multi-billion dollars private transport corporations? The Land Transport Authority (LTA), which is beefing up its contingency plans, has approached the Singapore Armed Forces (SAF) to explore deploying the men in green to give directions and manage crowds. The Defence Ministry also confirmed the move, saying that the SAF will work with LTA in the event of a major disruption, “while maintaining our primary responsibility to safeguard our security environment”. 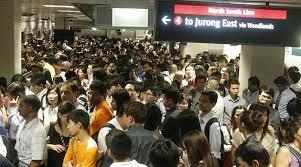 The latest move comes on the back of a spate of major incidents involving Singapore’s rail system. The most recent was the July 7 massive breakdown of the North-South and East-West MRT lines, which affected some 250,000 commuters during the peak hour.